Protein accumulation in the ER in P. falciparum-infected cells treated with brefeldin A. Infected red cells at early times of asexual growth, were incubated with 5 mgml-1 brefeldin A for 24 h and subsequently stained for PfHRPII (green), PfBiP (red), Hoechst (blue for nuclei), in indirect immunofluorescence assays and imaged by DeltaVision deconvolution microscopy. Yellow indicates extent of merge between green and red. The location to the ER may reflect altered (albeit reversible) membrane organization induced by the drug, rather than a specialized organelle. In addition, since the P. falciparum (primary) ER is not well characterized, the context of a secondary ER remains unclear.Haldar K, Mohandas N, Samuel BU, Harrison T, Hiller NL, Akompong T, Cheresh P. Protein and lipid trafficking induced in erythrocytes infected by malaria parasites. Cell Microbiol. 2002 4:383-95. Immunoelectron microscopy of LR White sections of asexual schizont stage were fixed in 1% paraformaldehyde:0.2% glutaraldehyde and incubated with sera (M40) against E. coli-produced Pfs40 MBP-fusion protein. Arrows point to labeling with gold particles. Nucleus (N); erythrocyte cytoplasm (EC). Bar equals 2.0 mM. This result indicates localization in a membrane-bound compartment adjacent to the nucleus that is suggestive of endoplasmic reticulumTempleton TJ, Fujioka H, Aikawa M, Parker KC, Kaslow DC. Plasmodium falciparum Pfs40, renamed Pf39, is localized to an intracellular membrane-bound compartment and is not sexual stage-specific. Mol Biochem Parasitol. 1997 ;90:359-65. Copyright Elsevier 2009. 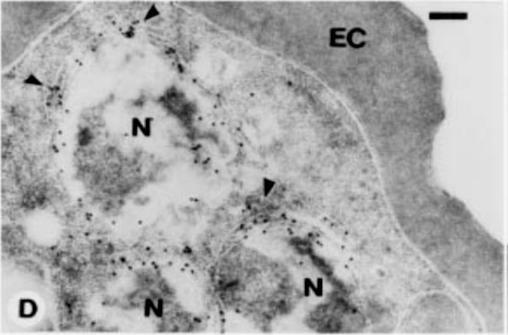 Intracellular location of Pfd-COP and comparison with the locations of the ER-located protein, PfERC, the trans -Golgi marker, PfRab6, and the PV-located protein, Exp-1. (A) Erythrocytes infected with young trophozoite stage (top panels) or mature trophozoite stage (bottom panels) malaria parasites (FAC8 strain) were labeled with affinity purified rabbit anti-GST-Pfd-COP(90) antiserum followed by an FITC-conjugated anti-rabbit IgG. 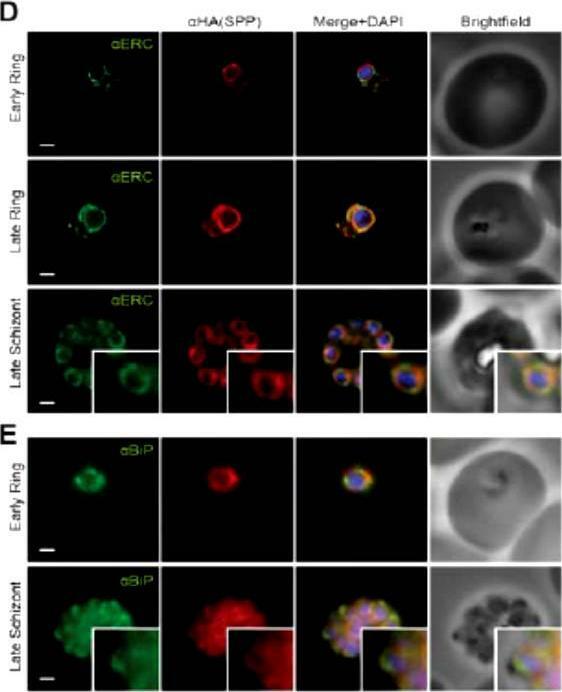 (B) Erythrocytes infected with trophozoite stage parasites (FAC8 strain) were labeled with affinity purified rabbit anti-GST-Pfd-COP(90) antiserum followed by an FITC-conjugated anti-rabbit IgG (green fluorescence) and a murine antiserum recognizing the ER-located protein, PfERC, followed by Alexa Fluor 568-conjugated anti-mouse IgG (red fluorescence). 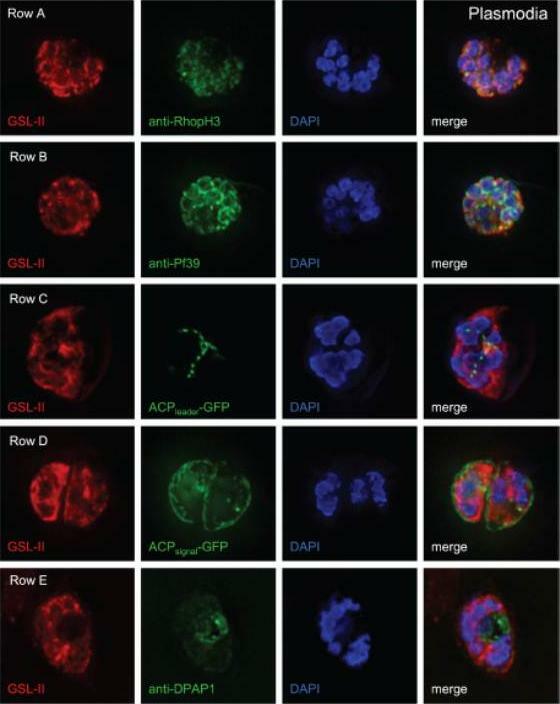 (C) Erythrocytes infected with trophozoite stage parasites (FAC8 strain) were labeled with affinity purified rabbit anti-GST-Pfd-COP(90) antiserum followed by an FITC-conjugated anti-rabbit IgG (green fluorescence) and a murine MAb recognizing the Golgi protein, PfRab6, followed by Alexa Fluor 568-conjugated anti-mouse IgG (red fluorescence). 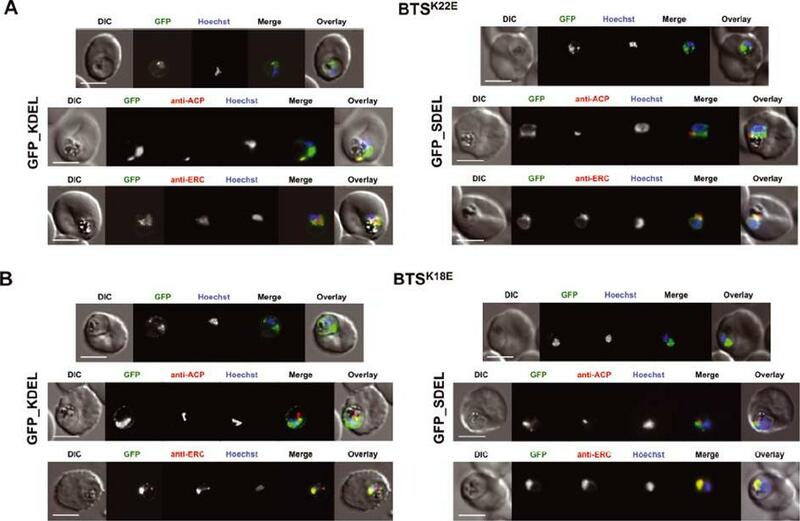 (D) Erythrocytes infected with trophozoite stage parasites (FAC8 strain) were labeled with affinity purified rabbit anti-GST-Pfd-COP(90) antiserum followed by an FITC-conjugated anti rabbit IgG (green fluorescence) and a murine MAb recognizing the PV located protein, Exp-1 PF11_0224, followed by Alexa Fluor 568-conjugated antimouse IgG (red fluorescence). Differential interference contrast (DIC) images are shown in the left hand panels. Overlays of the DIC and green fluorescence channels are shown in the right hand panels of (A). Overlays of the green and red fluorescence channels are shown in the right hand panels of (B-D). Optical slices were collected by confocal microscopy through the centre of the parasite. 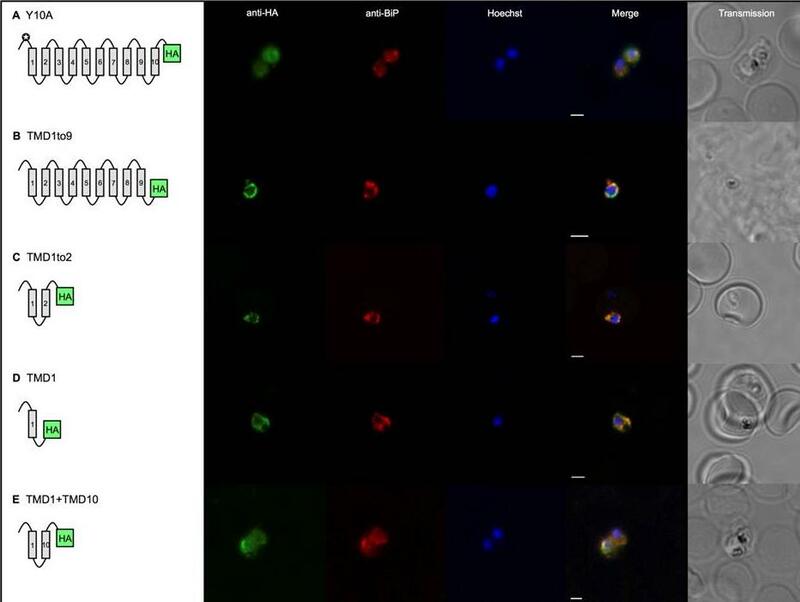 The bar in the top right hand panel represents 5 mm.Adisa A, Rug M, Foley M, Tilley L. Characterisation of a delta-COP homologue in the malaria parasite, Plasmodium falciparum. Mol Biochem Parasitol. 2002 123:11-21. Copyright Elsevier 2010. KAHRP chimaeras localise to the endoplasmic reticulum in addition to the parasitophorous vacuole or erythrocyte cytosol. Images captured by immunofluorescence microscopy show substantial colocalisation of KAHRP chimaeras with the endoplasmic reticulum calcium-binding protein ERC (upper panel). 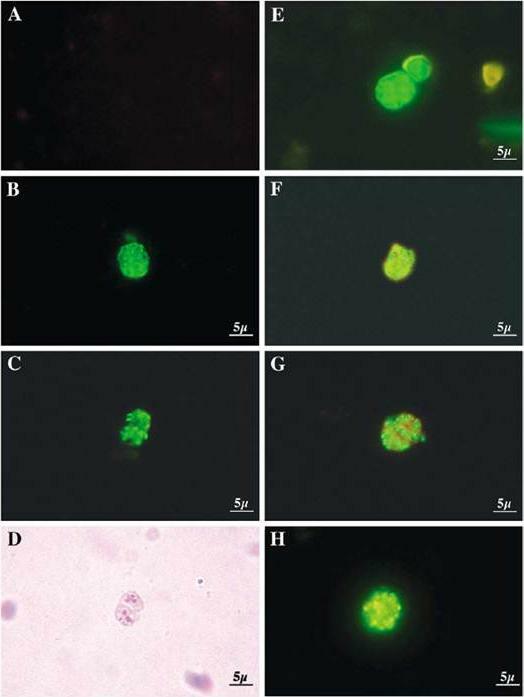 Intraparasitic fluorescence is also evident when chimaeras were colocalised with the parasitophorous vacuole membrane protein EXP-2 PF14_0678 (lower panel). Only the wild type (WT) PEXEL chimaera efficiently exported to the erythrocyte cytosol,Boddey JA, Moritz RL, Simpson RJ, Cowman AF. 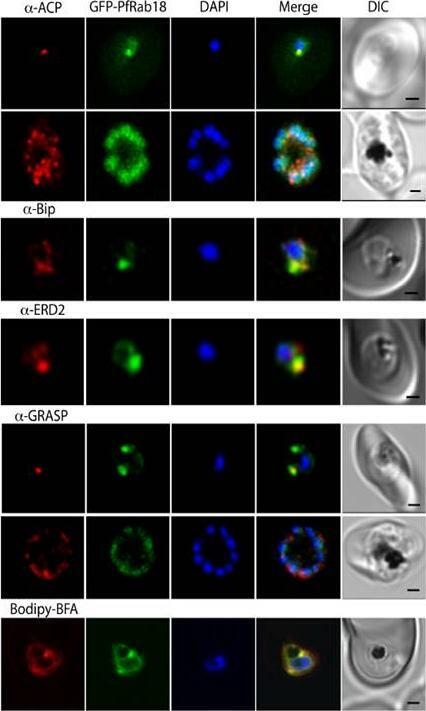 Role of the Plasmodium export element in trafficking parasite proteins to the infected erythrocyte. Traffic. 2009 10:285-99. Copyright John Wiley & Sons Ltd. 2010. Confocal immunofluorescence of PfSar1p. Panels A-C: Parasitized erythrocyes (D10 strain) were labeled with affinity purified anti=PfSar1p antiserum followed by fluorescein-conjugated anti-rabbit antiserum (green). Panels D-F: Transmission images of panels A-C. 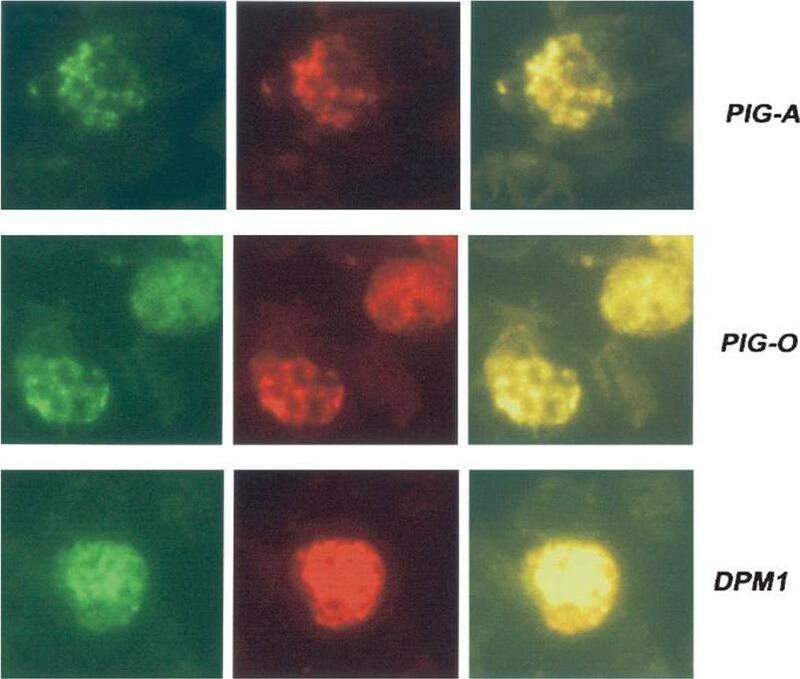 Panels G-L: Dual labeling of affinity-purified rabbit anti-PfSar1p antiserum followed by fluorescein-conjugated anti-rabbit antiserum (green) and a murine monoclonal antibody recognizing the parasitophorous vacuole-located protein, Exp-1, followed by rhodamine-conjugated anti-mouse antiserum (red). 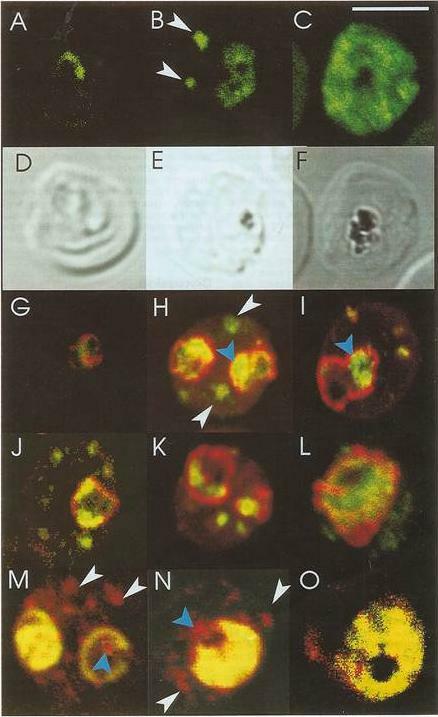 Sar1p in the trophozoite is clearly located in the erythrocyte cytosol (G-K) and in the schizont it occupies most of it (L). Panels M-O: Dual labeling of affinity-purified rabbit anti-PfSar1p antiserum followed by rhodamine-conjugated anti-mouse antiserum (red) and a biotin-conjugated anti-PfERC antiserum followed by fluorescein-conjugated anti-rabbit antiserum (green). PfERC and PfSar1p labeling patterns do not completely coincide, indicating that PfSar1p is not confined to the ER. An optical slice was collected through the center of the parasite by confocal microscopy. 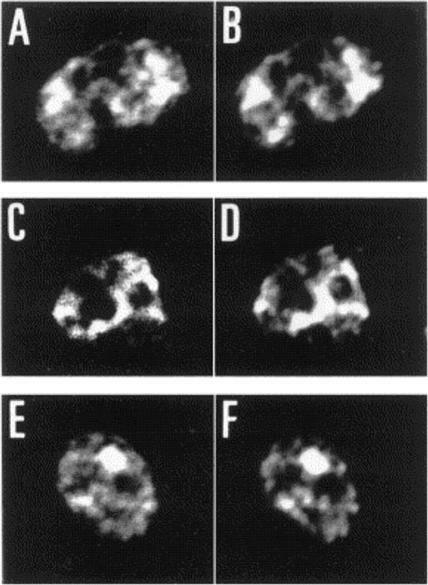 Some PfSar1p-containing structures in the erythrocyte cytosol are marked with white arrowheads. Some PfSar1p-containing structures in the parasite cytosol are marked with blue arrowheads. The bar in panel C corresponds to 5 mm.Albano FR, Berman A, La Greca N, Hibbs AR, Wickham M, Foley M, Tilley L. A homologue of Sar1p localises to a novel trafficking pathway in malaria-infected erythrocytes. Eur J Cell Biol. 1999 78:453-462. Copyright Elsevier 2010. Different PfRabs have different sub-cellular distributions in schizont-infected erythrocytes. Panel (A) shows control rabbit pre-immune serum. Panel (B) shows a multinucleated schizont decorated with anti-PfRab1A antibodies giving a perinuclear staining. Panels (C) and (D) (phase contrast) show the pattern obtained with the anti-PfRab11A antibodies. Clearly, PfRab1A and PfRab11A display different distributions. Panel (E) shows the pattern obtained with anti-Pf39 (ERC) antibodies specific for the endoplasmic reticulum. Panel (F) shows a double-labelling with anti-PfRab1A (green) and Pf39 (red) antibodies, where colocalization stains yellow. Panel (G) shows a double-labelling with anti-PfRab11A (green) and anti-Pf39 (red) and no co-localization is observed. Panel (H) shows anti-PfRab6 (green) and anti-Pf39 (red), where co-localization stains yellow.Quevillon E, Spielmann T, Brahimi K, Chattopadhyay D, Yeramian E, Langsley G. The Plasmodium falciparum family of Rab GTPases. Gene. 2003 306:13-25. 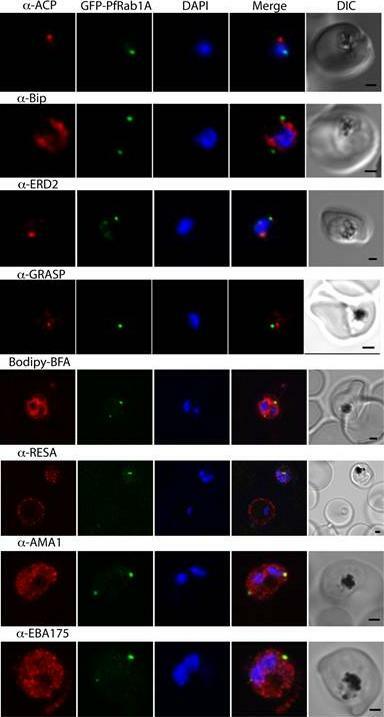 Deconvolving micrographs of Plasmodium-infected RBCs show that GSL-II, which binds to Plasmodium N-glycans, colocalizes with rhoptries (row A) and the ER (row B) but does not colocalize with apicoplasts (row C), the parasitophorous vacuole (row D), or the food vacuole (row E). In each case GSL-II is labeled red with Alexafluor 594, while antibodies labeled green with Alexafluor 488 are against RhopH3 (rhoptries), Pf39 (ER), and food vacuole (DPAP1). Alternatively, GFP is targeted to apicoplasts (ACPleader-GFP) and the parasitophorous vacuole (ACPsignal-GFP). Control experiments with anti-GFP antibodies show that both apicoplasts and parasitophorous vacuoles are accessible to exogenous probes. The nature of the glycosylated proteins is not knownBushkin GG, Ratner DM, Cui J, Banerjee S, Duraisingh MT, Jennings CV, Dvorin JD, Gubbels MJ, Robertson SD, Steffen M, O'Keefe BR, Robbins PW, Samuelson J. Suggestive evidence for Darwinian Selection against asparagine-linked glycans of Plasmodium falciparum and Toxoplasma gondii. Eukaryot Cell. 2010 9:228-41. PfGAP50 is located in the ER prior to recruitment to the IMC. A. Parasites expressing PfGAP50-GFP (green) were incubated with ER-Tracker (depicted in red). 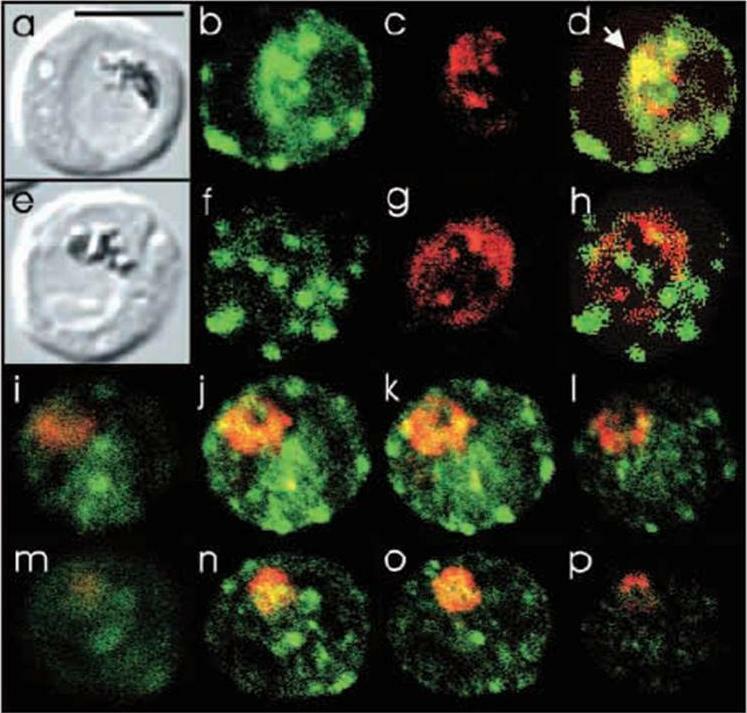 The GFP and ER-Tracker fluorescence is co-located in trophozoite stage parasites. Upon relocation of GFP fluorescence to the apical ends of nascent merozoites during early schizont stage, the reticular ER-Tracker labelling persists. PfGAP50-GFP is concentrated at one pole of released merozoites while ER Tracker labels internal structures. B. Fixed cell immunofluorescence microscopy of the 3D7 parent strain labelled with antibodies raised against PfGAP50 (green) and PfERC (red). C. Immuno-fluorescence microscopy of PfGAP50-GFP transfectants at the mature and ruptured schizont stages labelled with anti-GFP (green), anti-PfGAP45 (red) and DAPI (blue). Bars = 1 μm. 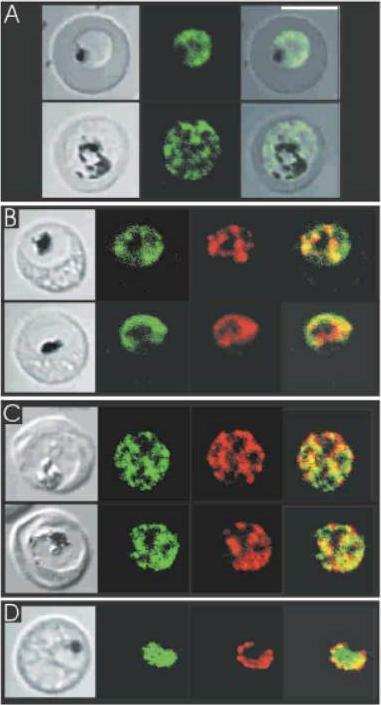 PfGAP50-GFP is located in the endoplasmic reticulum in early stage parasites, then redistributes to apical caps during the formation of daughter merozoites. In the final stage of schizogony the PfGAP50-GFP profile extends further around the merozoite surfaceYeoman JA, Hanssen E, Maier AG, Klonis N, Maco B, Baum J, Turnbull L, Whitchurch CB, Dixonand MW, Tilley L. Tracking glideosome-associated protein-50 reveals the development and organization of the inner membrane complex of P. falciparum. Eukaryot Cell. 2011 10(4):556-64. Immunofluorescence microscopy of fixed cells using anti-PfSec22 antibodies and goat anti-rabbit Alexa Fluor 555 secondary antibodies. 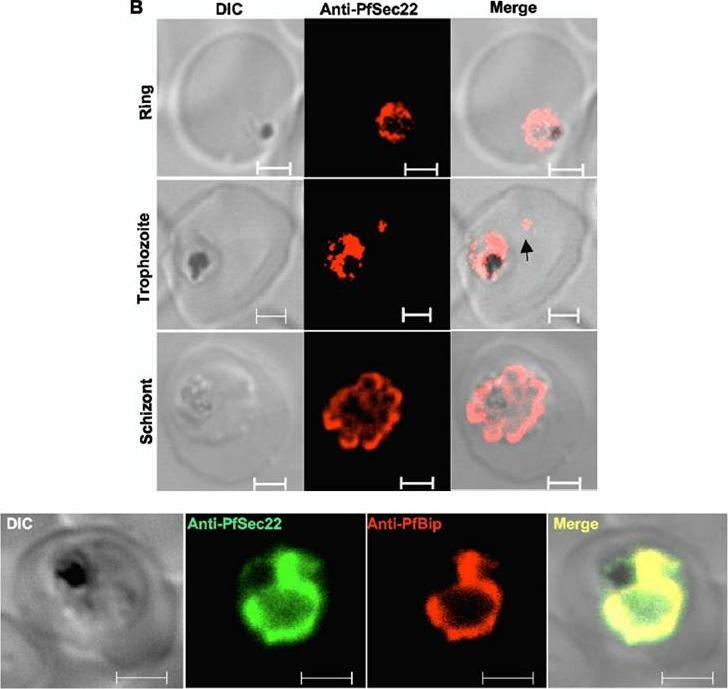 An intense ring of PfSec22 fluorescence is visible in ring- and trophozoite-infected cells. Isolated foci of PfSec22 fluorescence (arrow) are also detected in the host cell compartment in trophozoite-infected cells, suggesting export of PfSec22 into the erythrocyte cytosol. Scale bars, 2 mm.Bottom row: Coimmunolocalization and membrane association of endogenous PfSec22. The association of PfSec22 with the parasite ER was investigated by coimmuno-fluorescence assays using rabbit anti-PfSec22 and rat anti-PfBip antibodies, as indicated. Both proteins colocalized significantly within the parasite. Scale bars, 2 mm.Ayong L, Raghavan A, Schneider TG, Taraschi TF, Fidock DA, Chakrabarti D. The Longin domain regulates the steady-state dynamics of Sec22 in P. falciparum. Eukaryot Cell. 2009 8(9):1330-40. (D, Top) Immunofluorescence micrographs show rabbit a-PfPMV antibodies (Ra-PfPMV, green) label PfPMV in the ER. Colocalizations were performed with mouse a-PfPMV antibodies (Ma-PfPMV, red), shown previously to label PMV in the ER . (Middle) a-HA antibodies (red) label PfPMVHA (Top) and PvPMVHA (Bottom). P. vivax) in the parasite ER. (Bottom) a-HA antibodies (red) label PvPMVHA in the ER, as shown by clocalization with ERC (green). 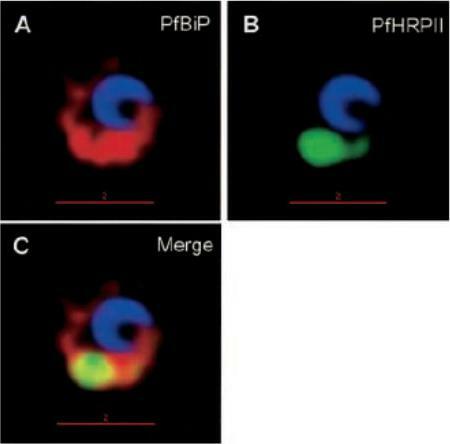 A strong perinuclear signal was observed in parasites expressing PvPMVHA or PfPMVHA (middle panels, red). Both proteins colocalized with rabbit anti-PfPMV antibodies, indicating the location was the ER. 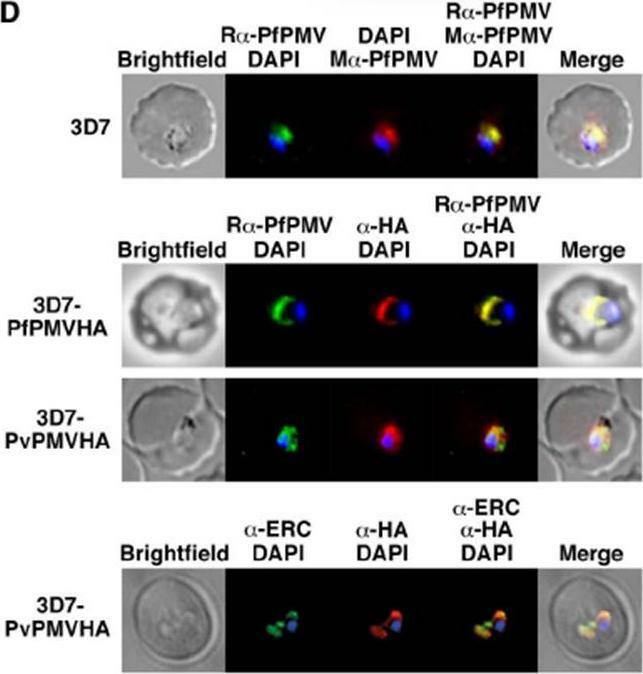 PvPMVHA also colocalized with ERC (bottom), as shown previously for PfPMVHA.Sleebs BE, Lopaticki S, Marapana DS, O'Neill MT, Rajasekaran P, Gazdik M, Günther S, Whitehead LW, Lowes KN, Barfod L, Hviid L, Shaw PJ, Hodder AN, Smith BJ, Cowman AF, Boddey JA. Inhibition of Plasmepsin V Activity Demonstrates Its Essential Role in Protein Export, PfEMP1 Display, and Survival of Malaria Parasites. PLoS Biol. 2014 12(7):e1001897. Analysis of ER retrieval strength compared to mutant transit peptides. A) Imaging of parasites expressing the K22E mutant form of ACP apicoplast leader sequence (BTSK22E) fused to GFP_KDEL (left panel) or GFP_SDEL (right panel). Upper panel: live-cell imaging; middle and lower panels: immunofluorescence assay using anti-PfACP or anti-PfERC. B) Imaging of parasites expressing the K18E mutant form of ACP apicoplast leader sequence (BTSK18E) fused to GFP_KDEL (left panel) or GFP_SDEL (right panel). Upper panel: live-cell imaging; middle and lower panels: immunofluorescence assay using anti-PfACP or anti-PfERC. Scale bar: 3 μm.Heiny SR, Pautz S, Recker M, Przyborski JM. 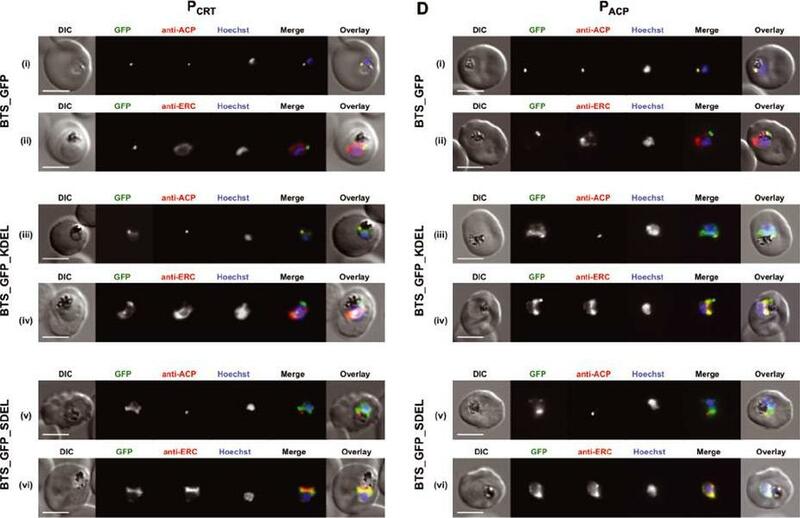 Protein Traffic to the Plasmodium falciparum Apicoplast: Evidence for a Sorting Branch Point at the Golgi. Traffic. 2014 5(12):1290-304. Comparison of the location of PfSec31p with the ER-located protein PfERC in P.-falciparum-infected erythrocytes and semiquantitative analysis of the amount of PfSec31p in the erythrocyte cytosol. (a-h) Asynchronous infected erythrocytes (K1 strain) were probed with affinity-purified rabbit anti-PfSec31(WD) antiserum followed by a fluorescein-conjugated anti-rabbit IgG (green fluorescence) and a murine antiserum recognising the ER located protein PfERC followed by Alexa-Fluor-568-conjugated antimouse IgG (red fluorescence). A region of partial overlap ofPfSec31p and PfERC in the parasite cytosol in (d) is marked with an arrowhead. (i-p) Asynchronous infected erythrocytes (K1 strain) were probed with rabbit anti-PfSec31(WD) antiserum (green fluorescence; i-l) or a murine anti-PfERC (red fluorescence; m-p). Four optical slices (0.6 mm) were collected by confocal microscopy from the bottom to the top of the parasitised erythrocytes.Adisa A, Albano FR, Reeder J, Foley M, Tilley L. Evidence for a role for a Plasmodium falciparum homologue of Sec31p in the export of proteins to the surface of malaria parasite-infected erythrocytes. J Cell Sci. 2001 114(Pt 18):3377-86. 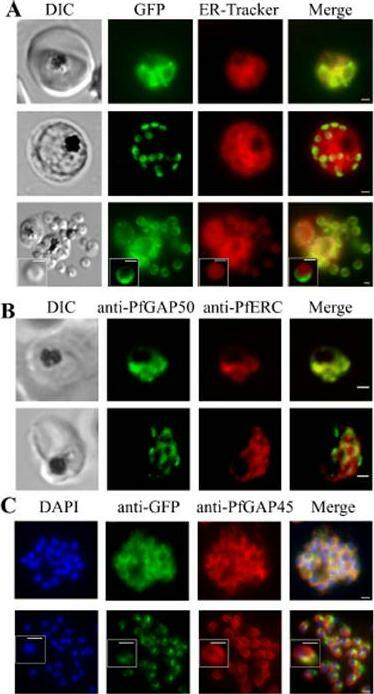 (c) p40PX-GFP localizes to the cytoplasm and to membranes of the food vacuole (labelled with anti-CRT) and apicoplast (labelled with anti-ACP). 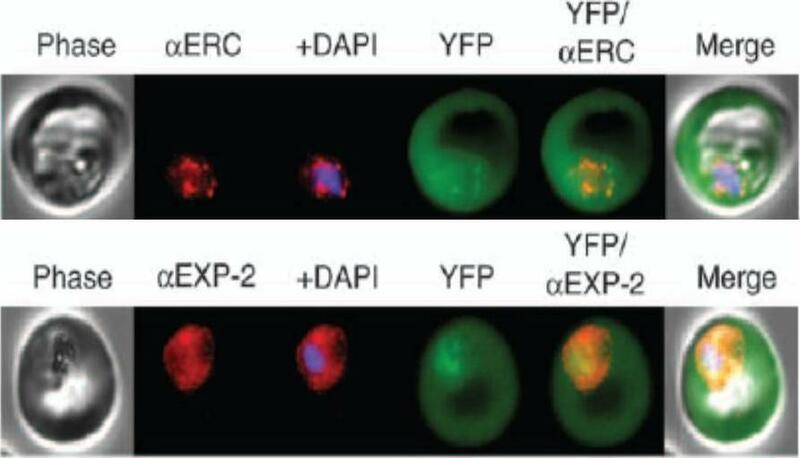 STEVORss-p40PX-GFP localizes to the PV in P. falciparum-infected erythrocytes, as shown by co-localization with anti-EXP2, and not in the ER, which was labelled with anti-PMV. If PI(3)P was located within the ER, this chimera would be expected to remain within the ER via p40PX binding. Fusion to an ER-retention signal (STEVORss-p40PX-GFPSDEL) retains the protein in ER, co-localization with anti-ERC. Scale bar, 5 mm. (d) Localization of Hrs-GFP to the cytoplasm and membranes of food vacuole (labelled anti-CRT) and apicoplast (labelled anti-ACP). STEVORss-Hrs-GFP localizes to the ER as shown by co-localization with anti-ERC; however, mutation of residues necessary for lipid binding in both Hrs FYVE fingers (STEVORss-HrsC215S-GFP) does not abrogate ER localization, demonstrating PI(3)P-independent retention in ER. Addition of ER retention signal (STEVORss-Hrs-GFPSDEL) also causes ER localization. Scale bar, 5 mm. Boddey JA, O'Neill MT, Lopaticki S, Carvalho TG, Hodder AN, Nebl T, Wawra S,van West P, Ebrahimzadeh Z, Richard D, Flemming S, Spielmann T, Przyborski J,Babon JJ, Cowman AF. Export of malaria proteins requires co-translationalprocessing of the PEXEL motif independent of phosphatidylinositol-3-phosphatebinding. Nat Commun. 2016 Feb 1;7:10470. Select gene expression constructs not targeted to the apicoplast are now co-localised with the endoplasmic reticulum. TMDs are represented by boxes and are joined by loops. All PfoTPT constructs are episomally expressed under the PfCRT promoter and tagged with triple HA at the C-terminus detected with anti-HA and secondary antibody conjugated to FITC (green). The parasite ER is detected with anti-BiP (red). Nuclei are stained with Hoechst (blue), and transmitted light images of the parasites within their host red blood cell are shown at right. Scale bars = 2μm. A. Point mutation of tyrosine residue at position 10 (✪) in the synthetic PfoTPT (Y10A) relocates protein from the apicoplast (B) to the ER, as well as the plasma. B. Removal of TMD 10 (TMD1to9), which completely abrogates targeting to the apicoplast (C), results in perinuclear localisation of the protein that almost entirely overlaps with the ER marker, BiP. C. Removal of TMDs 3, 4, 5, 6, 7, 8, 9 and 10 (TMD1to2), which completely abrogates targeting to the apicoplast (G), results in re-localisation of most of the protein to the ER. D. Removal of TMDs 2, 3, 4, 5, 6, 7, 8, 9 and 10 (TMD1), which completely abrogates targeting to the apicoplast (H), primarily results in localisation of most of the protein to the ER. E. Recombining TMD1 with TMD10 (TMD1+10) was unable to reconstitute apicoplast targeting (I) and resulted in some perinuclear ER targeting, plus some parasite plasma membrane targeting.Lim L, Sayers CP, Goodman CD, McFadden GI. Targeting of a Transporter to the Outer Apicoplast Membrane in the Human Malaria Parasite Plasmodium falciparum. PLoS One. 2016 11(7):e0159603.